Leader in panel mounting systems, Fastmount, has launched its new panel restraint, Seismount, for ceiling and wall panels in high volume marine and architectural applications. The Seismount panel restraint is an extension of the Fastmount PanelSafe range, which provides added security and control to removable ceiling and wall panels. The restraint was designed with the high volume, commercial customer in mind, with its design taken back to basics to deliver a cost effective system without sacrificing high performance. 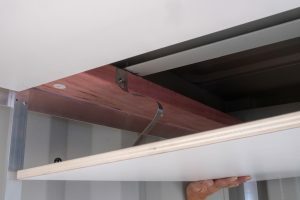 The Seismount allows ceiling panels to be suspended 225mm below the ceiling substrate for convenient servicing and controlled removal of the panel, with a quick unhook of the strap from the mounting screw. When used with large wall panels, the Seismount provides extra security and controlled removal by one person. Once installed, the restraint folds flat into the space between the panel and substrate (fitting snugly into a 2.5mm gap), allowing a panel to be removed and replaced countless times before compromising strength. Its break load of 144kg per restraint (SGS NZ) ensures that large or heavyweight ceiling panels will remain secured. The restraint is available in two metal types – galvanised steel (PS-SR225S), recommended for architectural applications, and stainless steel (PS-SR225SS), recommended for marine, with no special installation tools required. “With architectural sales increasing year on year, it became evident that we had to design a panel restraint system that could fit in with these high volume projects as well as fill a gap in the marine market – simple design, easy installation, and at a lower cost than our existing restraint systems that have been so popular in the superyacht world,” says Gregg Kelly, Managing Director of Fastmount. ThePanelSafe Seismount is available from authorised Fastmount distributors worldwide, accompanied by Fastmount’s range of panel mounting systems. Fastmount is an award-winning New Zealand company designing and manufacturing hidden fasteners specifically to service the marine, architectural, aviation and recreational vehicle industries globally. With boatyards in over 50 countries using the Fastmount Panel Mounting System, its exceptional performance in the marine sector has since attracted companies in the architectural, recreational vehicle and aviation industries to use Fastmount products. Fastmount’s global network of agents and distributors combines extensive experience in the marine industry and understanding of the architectural and interior design sectors. For more information about Fastmount visit www.fastmount.com.